In the summer of 2016, with generous funding support from the South Carolina Conservation Bank and the SC Native Plant Society, Naturaland Trust was able to protect 13 acres of waterway that provides refuge for a stunning population of rocky shoals spider lilies. The Rocky Shoals Spider Lily (hymenocallis coronari) is a spectacular native plant that blooms dramatically in May. The plant lives in river communities only in Alabama, Georgia, and South Carolina. It was initially discovered by Bartram in his 18th century visit to the Savannah River. It lives in and beside rocky rivers in the lower Piedmont. As a species, it has been devastated by dams, water quality decline, and development. It has been under consideration to be federally listed as an endangered species. 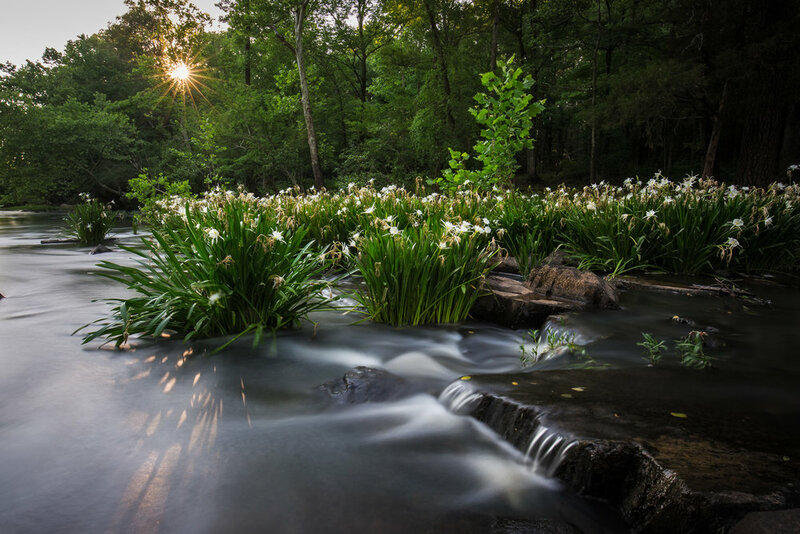 Naturaland Trust’s founder, Tommy Wyche, sponsored an effort by members of the Society to re-establish Rocky Shoals Spider Lily populations in Piedmont rivers. In fact, this past spring after Tommy’s death, one Rocky Shoals Spider Lily bloomed at the base of the Wyche Law Firm in the Reedy River in Greenville. In South Carolina, one of the largest remaining populations anywhere exists in the Catawba River at Landsford Canal State Park in Chester County. Stephens Creek, a tributary of the Savannah River, contains the State’s other significant population. This plant is a surviving representative of the pre-European natural landscape of South Carolina. It is an integral part of a landscape of rocky rivers, clean water, Piedmont declines in elevation leading to free flowing water, and undammed waterways. The river ecology along this 13-acre site is a glimpse of what the South Carolina Piedmont looked like when Columbus landed in the West Indies. To have a chance to visit this site with Naturaland Trust and the Native Plant Society, sign up for our newsletter and join us on a field trip in May.